In 2013 an international team of astronomers discovered that Milky Way galaxy "wobbles." In addition to the regular Galactic rotation the scientists found the Milky Way moving perpendicular to the Galactic plane. The Milky Way acts like a Galactic mosh pit or a huge flag fluttering in the wind. north to south, from the Galactic plane with forces coming from multiple directions, creating a chaotic wave pattern. The source of the forces is still not understood: possible causes include spiral arms stirring things up or ripples caused by the passage of a smaller galaxy through our own. The team of astronomers from the Leibniz Institute for Astrophysics Potsdam (AIP) detected and examined this phenomenon with the RAdial Velocity Experiment (RAVE), a survey of almost half a million stars around the Sun. 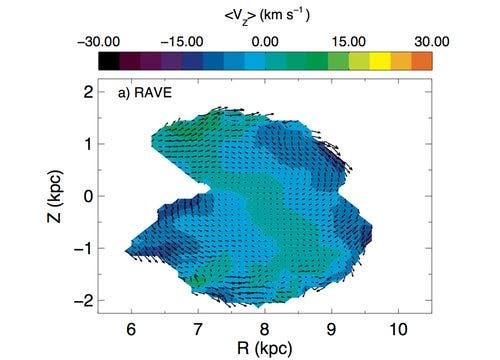 RAVE is a multi-fiber spectroscopic astronomical survey of stars in the Milky Way using the 1.2-m UK Schmidt Telescope of the Anglo-Australian Observatory (AAO). The RAVE collaboration consists of researchers from over 20 institutions around the world and is coordinated by the Astrophysical Institute Potsdam (AIP). As a southern hemisphere survey covering 20,000 square degrees of the sky, RAVE's primary aim is to derive the radial velocity of stars from the observed spectra. Using a special class of stars, red clump stars, which all have about the same brightness, mean distances to the stars could be determined. The velocities measured with RAVE, combined with other survey data, could be used to determine the full 3D velocities (up-down, in-out and rotational). In this study, RAVE stars were used to examine the kinematics (velocities) of stars in a large, 3D region around the Sun – the region surveys 6500 light years above and below the Sun's position as well as inwards and outwards from the Galactic centre, reaching a quarter of the way to the center. Using a special class of stars, red clump stars, which all have about the same brightness, mean distances to the stars could be determined. This was important as then the velocities measured with RAVE, combined with other survey data, could be used to determine the full 3D velocities (up-down, in-out and rotational). The RAVE red clump giants gave an unprecedented number of stars with which it is possible to study 3D velocities in a large region around the Sun. The 3D movement patterns obtained showed highly complex structures. The aim was then to untangle these structures, concentrating on differences between the north and south of the Galactic plane. From these velocities it was seen that our Galaxy has a lot more going on than previously thought. The velocities going upwards and downwards show that there is a wave-like behaviour, with stars sloshing in and out. The novel element in the approach was true 3D observation, showing how complex the velocity landscape of the Galaxy really is. Modellers now have the challenge of understanding this behaviour, be it from ripples from an eaten galaxy or the wake from spiral arms. These new findings will make it possible to make 3D models of our Galaxy much more precise. The publication "The wobbly Galaxy: kinematics north and south with RAVE red clump giants" can be found online at http://arxiv.org/abs/1302.2468 and was published this month in Monthly Notices of the Royal Astronomical Society (MNRAS). Star Streams of the Milky Way –"Trace of the Orbits of Ancient Globular Clusters"